Case nº1 of graceful fallbacks for browsers without flexbox. Flexbox has long been the promise of a revolution, had it been specified as it is today, when the original proposal came out, the adoption today would be complete. I’ve been playing with flexbox since the original syntax came out, and I loved it, specially coupled with media-queries, there was even a polyfill for IE. But as I tried to use it in production, I spent a week trying to figure things out, found big inconsistencies and bugs in the implementations that made it impossible to use it in production, with a disillusioned heart I dropped it. Four years later it’s ready for everyday use (with the proper fall-backs). Much has been demoed and written about how to use flexbox, it now gracefully solves problems that where impossible or too complicated to solve in CSS. There also has been a huge effort to find out how to write CSS in order to cater for each of the 3 implemented syntaxes. Today, with autoprefixer all I need to write is the modern syntax and the preprocessor takes care of it all. It’s the classic case where the content is so small that the footer is no where near the actual footer of the window. In the past, if you knew the height of the footer and if it stayed the same there was a smart trick, sadly the trick is scarcely relevant now. We don’t know the footer’s height. In modern day responsive world you never know the height of your footer. Even if you don’t build responsive layouts, if you use a CMS, the odds are that the footer content is editable by the site owner, so you’ll never be certain of the height. Here flexbox comes to the rescue . But what to do in browsers without flexbox? or where to fall back? 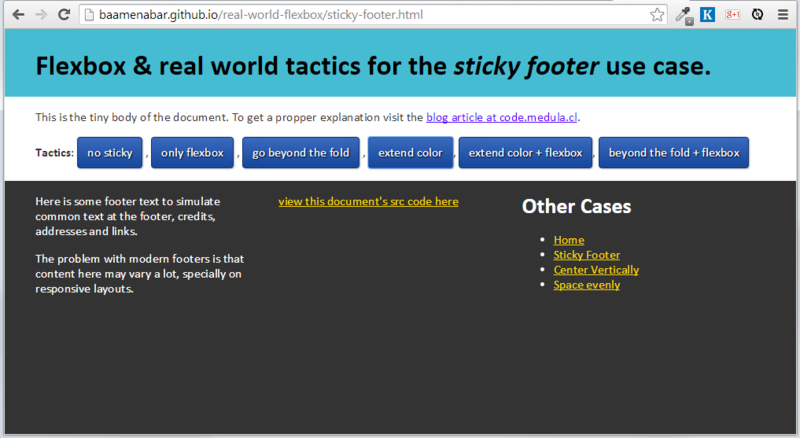 Here are some options showing possible fallbacks baamenabar.github.io/real-world-flexbox/sticky-footer.html . In all CSS solutions we need for the document container and the body to fill all the available height of the window. You will always know the minimum height the footer can have. The least we can do is push it to the bottom and show at least that much. 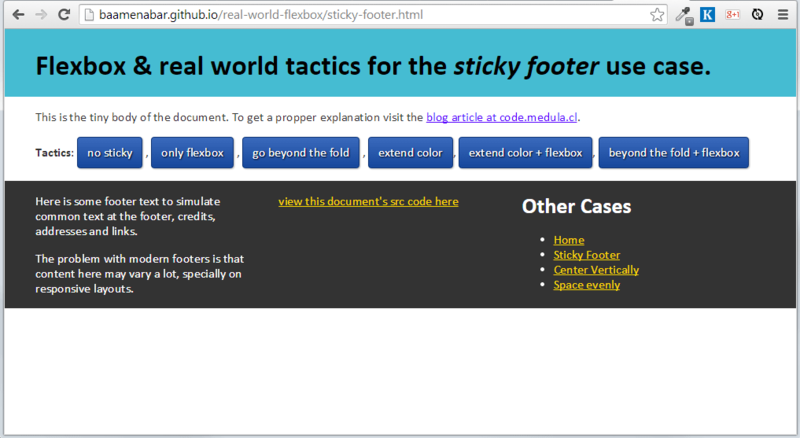 We will borrow code from Ryan Fait`s Sticky Footer technique . This looks like the content is bigger than the window, which, in some cases, is better than the “too little content” layout. If you want to use flexbox with this fallback you need modernizr, or the fallback will overwrite the flexbox properties. 4. 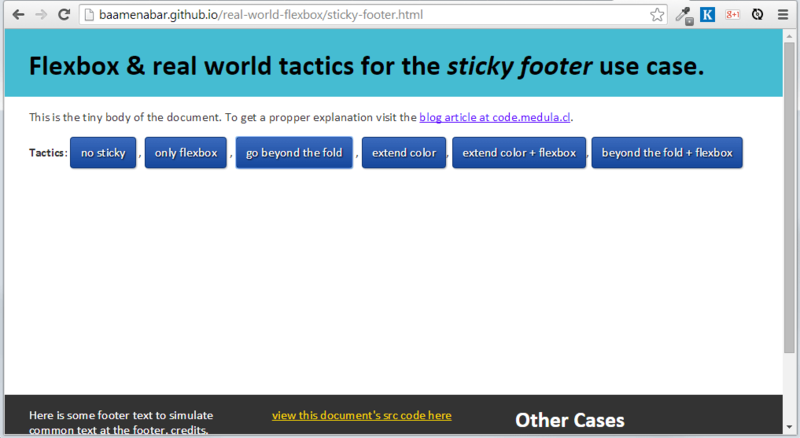 “Extend” the footer background color. In truth what happens here is that the background of the body is the same of the footer, and the wrapper .global-wrapper that holds the rest of the content has the actual background color for the content. This option is my favourite as it doesn’t need modernizr. I’ll be soon tackling other flexbox use cases and finding proper fallbacks for each.